VirtualLink is the new USB-C single cable standard for future VR headsets, GPUs, and laptops. It’s intended to simplify the setup process of VR and ensure compatibility with USB and power requirements of future headsets. It also allows gaming laptops to easily support VR- and perhaps even smartphones and tablets one day. The standard was founded back in July by Oculus, Microsoft, Valve, NVIDIA, and AMD. In October, HTC joined the standard too. So VirtualLink isn’t some proprietary NVIDIA offering. The famous xkcd comic about new standards doesn’t apply here. All the major PC VR players are onboard- and it’s an open standard. But isn’t it just about convenience? VirtualLink will provide video, audio, data (USB), and power all through the single cable and port. So yes, convenience is one advantage. One dedicated port for VR replaces the many of the past. But it’s the sheer amount of power & data that really matters- a minimum of 15 Watts of power and 10 Gbit/sec of USB data. That’s more power than three USB 3.0 ports would provide, and as much data as two would. Furthermore, VirtualLink GPUs must include a standards compliant USB controller for this data. With the Oculus Rift, many users encounter USB bandwidth issues with the tracking sensors. That’s because many USB controllers on motherboards simply don’t comply with the USB spec properly. Oculus Support tells these users to buy a USB PCI-E card from Amazon with a compliant controller. So for up upcoming headsets with many onboard cameras like the Rift S and Vive Cosmos having a VirtualLink port will ensure your shiny new VR headset will “just work” with your PC- no USB headaches. But for buyers without a VirtualLink GPU, these kinds of USB issues could very well happen again. The spec defines an adapter for using a VirtualLink headset with a PC lacking the port. We expect all PC VR companies will include such an adapter- it wouldn’t make business sense to only support RTX GPUs. But this adapter requires not only DisplayPort and USB 3.0, but also an AC power brick. And for that USB port you’ll still be at the mercy of your motherboard. If you wanted to buy a VR-compatible laptop before VirtualLink- good luck. For the Oculus Rift you’d need to make sure it even had enough free USB ports, and for the HTC Vive you’d need a socket for the headset as well as your laptop. And that’s not even the hard part. Many laptops had HDMI ports which weren’t directly connected to their dedicated GPU, making them incompatible for VR. Even discovering this was a difficult task, as the spec was not made public for many laptops. The post Editorial: Why The VirtualLink USB-C Port Matters appeared first on UploadVR. Codemasters announced on Twitter that DiRT Rally 2.0 will get Oculus Rift VR support this summer. The tweet shows an image of a Rift, no other headsets were mentioned, and states “@Oculus heard you”. This makes it likely exclusive to the Oculus platform. DiRT Rally 2.0 releases on 26th February- just over two weeks from now. It was announced back in September, but Codemasters stated multiple times they had no plans for VR support. Based on the wording of the tweet it seems Oculus have changed their mind- likely financially like with the original game. The original DiRT Rally launched in late 2015. It got Oculus Rift support in summer 2016- just after the headset’s launch. Oculus funded this VR support, so it was not released to SteamVR headsets. DiRT Rally VR is the new high water mark for VR racing games. It never shies away from the challenges of this new medium and consistently offers creative solutions to maintain both its functionality and its sense of fun. DiRT is able to remind you at every turn just how exciting, surprising, and enjoyable racing simulators in VR can truly be. 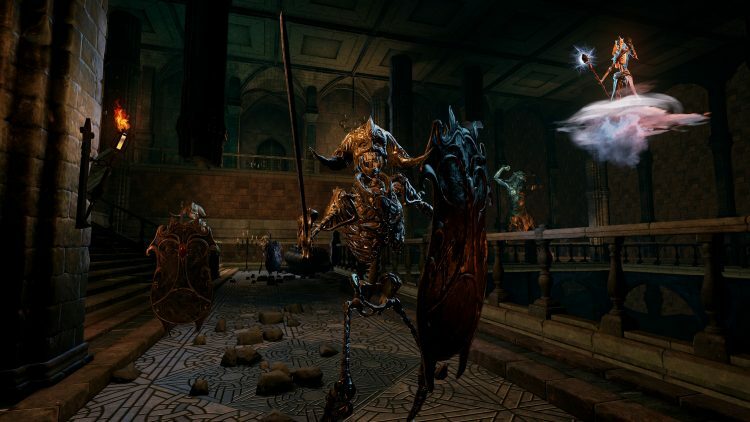 The PlayStation 4 version of the game got PSVR support in February 2017. This indicates the Oculus exclusitivity was only on PC. We were just as impressed when we reviewed this PSVR port, noting it played almost identically to on PC. So while the wording of the tweet and history of the original game make it likely this will be Rift exclusive on PC, there’s still a good chance it will eventually come to PlayStation VR too. Regardless, we’re happy it’s getting VR support as it’s perfectly suited for it. The post DiRT Rally 2.0 Will Get Oculus Rift VR Support ‘This Summer’ appeared first on UploadVR. Google’s AR Playground now includes a set of characters showcasing Childish Gambino dance moves. The character reacts to facial expressions too. So if you take a selfie with the character, it should respond. The project joins a series of partnerships and experiments from Google as the company explores the AR and VR space. Previous AR partnerships from Google include similar treatments for Star Wars and Stranger Things characters. Google is encouraging Pixel owners to use the hashtag #pixeldanceoff for videos showing people dancing with the virtual character. The below video from Google previewing the feature shows how it represents Gambino’s signature moves. Pixel phones aren’t the most popular devices on the market so these kinds of videos are unlikely to become a viral sensation. Nonetheless, you can see in the video how well the moves are represented on the digital character and how well Google’s AR software inserts the character into the scene. We’re expecting a big year ahead from Google with Google I/O happening May 7 to 9. The event is likely to showcase next steps in AR and VR from the technology giant. Late last year, the company started seeding new VR controller kits to developers which add more intuitive input to the Daydream platform. The post Dance Along In AR With Childish Gambino On Pixel Phones appeared first on UploadVR. It’s been a while since we’ve heard from Ghost Giant. The PSVR exclusive was first announced at E3 last year, but we’ve barely seen it since. Rest assured, though, the game is still on its way. In fact, it now has a publisher. UK-based Perp Games today announced that it will launch the game both digitally and physically in EU territories this spring. A physical release will follow later in North America, though the game should launch around the same time digitally. Perp has specialized in publishing indie PSVR games over the past year; it published Smash Hit Plunder in late 2018 and will soon release the console version of Sairento VR. Developed by Fe creator Zoink Games, Ghost Giant is another VR game in which the player befriends smaller creatures. You form a bond with a small boy called Louis and explore the world of Sancourt, assisting the town with issues. The world around you is like a model village with houses you can peer into by lifting off roofs and moving furniture. Its art style is absolutely gorgeous and there seems to be extensive voice acting. Nice work there, David. There’s no specific release date for the game yet but we’ll let you know as soon as we do. The post PSVR Exclusive Ghost Giant Finds Publisher In Perp Games appeared first on UploadVR. Could 2019 Be a Defining Year for XR? Luminous’ MD Seems to Think so Luminous Group's Ben Bennett looks at the future of XR. Oculus Quest will have a different store and requirements than Oculus Go and Rift. As they are different devices with different inputs there are no plans to implement cross-buying from Oculus Go to Oculus Quest at this time. This field, however, is apparently not an indication of cross-buy support from Oculus. Still, Oculus has yet to reveal its full plans for headset development across multiple Facebook headsets. We’ll update as soon as we get more information regarding cross-buy features from Facebook. This post is updated from an earlier version which suggested the field might be an indication of cross-buy features. The post Oculus Says No Plans For Cross-Buy Between Go And Quest appeared first on UploadVR. A VR experience is among the attractions at a touring Halo fan event passing through major cities this summer. The Training Grounds will “simulate what it takes to be a Spartan, in an immersive, Halo themed combat training environment,” according to the website for Halo: Outpost Discovery. The trailer above shows shots of Vrcade backpack systems and an HTC Vive. We’ve reached out to Vrcade for details on the experience and will update this post if we hear anything. Hopefully this VR training is quite a bit more involved than the disappointing training experience released in 2017. That experience, while officially endorsed, was single player and pitted players against targets represented on a flat screen. Halo: Recruit became the very definition of disappointing wave shooter when it debuted in connection with Windows-based VR headsets. So practically anything else at Halo: Outpost Discovery would be a step up for the Halo franchise in VR. Halo: Outpost Discovery kicks off first in Orlando (July 5-7) and then travels through Philadelphia (July 19-21), Chicago (August 2-4), Houston (August 16-18) and finally Anaheim (August 30-September 1). We’re of course expecting major announcements later this month from Microsoft in connection with Mobile World Congress in Barcelona. While we are expecting news regarding the HoloLens product line, Halo is an important franchise to Microsoft and it is always possible that it makes an appearance in connection with new hardware announcements. The post Halo VR Training Included In Touring Fan Event appeared first on UploadVR. The post Traveling Halo Fan Experience Will Feature Competitive Location-Based VR appeared first on VRScout. The post The Mage’s Tale PSVR Livestream: Beginning Our Quest appeared first on UploadVR. OrbusVR: Reborn is due to relaunch the titular VR MMO this April with new classes, features, zones, and more. Not much longer! The post VR MMO OrbusVR: Reborn Overhaul Set To Release In April 2019 appeared first on UploadVR. The post How To Fix “We’re Having Trouble Starting Oculus” Rift Error appeared first on UploadVR. VR Exhibition Speculative Cultures Opens in New York The exhibition runs through until April. The post Zero Latency’s Latest Free-Roam Experience Made Me A Believer In VR Esports appeared first on VRScout. Astro Bot Rescue Mission was without a doubt one of the best and most beloved VR games of 2019. It wasn’t just a great platformer but a game explored the platform in fascinating ways. At the 2019 Game Developers Conference (GDC) next month, you can see how the developers pulled it all off. Sony Japan Studios creative director Nicolas Doucet will host a session at the conference. It’s titled ‘Making of ‘Astro Bot Rescue Mission’: Reinventing Platformers for VR‘. As the name suggests, the talk will see Doucet dive into the prototyping and designing needed to bring Astro Bot to life. He’ll talk about how the team experimented with new ideas and some of the challenges of making a VR game. But that’s not the only Astro Bot talk at GDC. Programmer Yuki Miyamae will also be discussing ‘Taming Technologies Behind ‘Astro Bot Rescue Mission’‘. This session will be more focused on the technical challenges to get the game running in VR. Neither talk has been dated just yet but expect to see a proper schedule soon. We’ll be at GDC ourselves to bring you all the latest VR updates. The post GDC 2019: Sony To Talk The ‘Making Of Astro Bot’ On PSVR appeared first on UploadVR. Australia-based VR company Zero Latency is debuting its new team-based competitive VR shooter at locations worldwide. Sol Raiders is opening at 25 locations running Zero Latency’s large-scale VR platform. In the game, two teams of up to four players each face off across three rounds. The company invited me to its Las Vegas location in the MGM Grand to check out the new game. What’s notable immediately about Zero Latency is that they’ve got a custom tracking system following the location of a modified OSVR HDK 2 and their own gun design. I strapped on their backpack, adjusted the OSVR lenses and entered their Holodeck-like stage for the first time. While Zero Latency’s stages are large-scale free-roam spaces in the real world, they can be transformed into tight corridors in VR. In one of the rounds, shooting doors makes them open to sometimes reveal players hidden on the other side. Another area requires you to step onto a lift and then shoot a target to tell it to go to a new area. Snipers attack from nests overhead. Getting shot or having a door close while you’re standing in its way kills your avatar and requires you to walk back to the respawn point. Both during gameplay and after death players are alerted to the actual locations of other physical players. There’s a radar system during gameplay and the game’s oversized virtual gun helps you to keep a safe distance from other players long before bumping into them. With a team-based shooter, the idea is that Zero Latency’s locations could become hubs for competitive combat from more repeat visitors. Sol Raiders supports English, Spanish and Japanese at launch. I got an email in my pocket with the results of my match the moment it was finished. Though I crushed the competition in overall kills, they beat us in two rounds by achieving the objectives more frequently. This was my first time testing an OSVR headset since E3 2016 when Razer put me inside an experience without positional tracking. Zero Latency did the hard work of adding its own positional tracking solution and created an entirely different caliber of experience. The post Hands-On With Zero Latency’s Team Shooter Sol Raiders appeared first on UploadVR.